Another recording pulled out from the not enough I have of Galaxie 500. 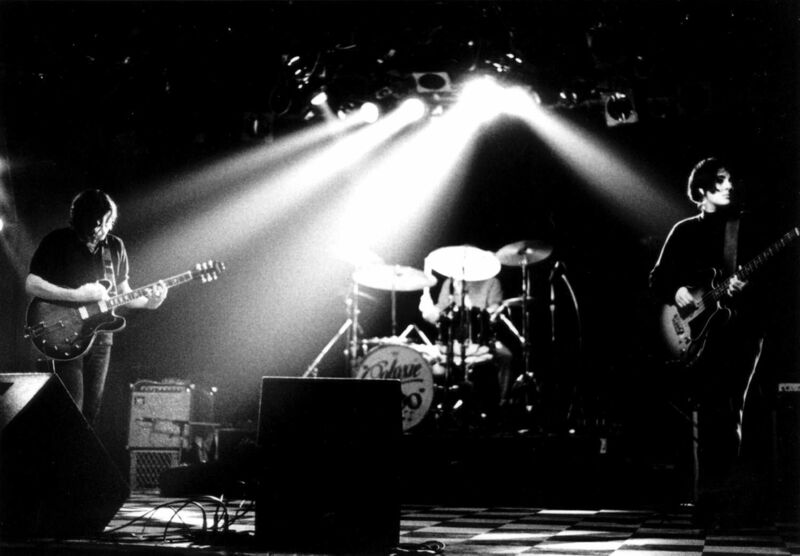 In 1991 Galaxie 500 headed out on what was to be their last tour of the US supporting The Cocteau Twins. This recoding is from the second night at the Warfield Theatre in San Francisco and was probably a couple of nights after the accidental or pre-meditated use of a spotlight signalled the beginning of the end of Galaxie 500 (see BOTH Damon & Naomi's Ptolemaic Terrascope interview and Dean's Black Postcards for both sides of that story). The recording is not too bad, and the seven song set is a gem. Within a couple of months it would all be over. I first read about the split in the Melody Maker at the beginning of May. I was sad. The picture is (obviously) not from the show the recording is... I wonder if you still need to prop your amps on beer crates when you play in the big venues?